Sieve and knead the flour into a soft dough. To knead the flour add 1 tbsp of refined oil, 1 small tsp salt and sufficient water. In a separate bowl beat the eggs add salt and pepper to taste. In a bowl put chopped onion, tomato, green chillies, coriander leaves and mix well with salt and pepper powder. Divide the dough into equal portions. Roll out 1 dumpling into round and thin chapati. Place the chapati on a heated non stick pan. Immediately spread 1 tbsp of beaten egg evenly on the roti. Spread the above mixture of chopped onion and tomato over the beaten egg. Now, carefully fold the roti into a triangle . Shallow fry the paratha untill crispy golden. Follow the same procedure with the rest of the dumplings. 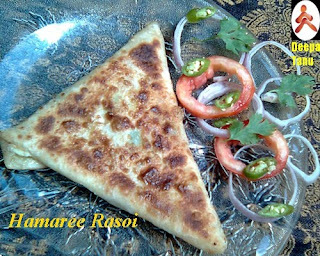 For those who wish to stuff it with keema also can refer to the post " Keema chop" for preparing the keema. First time on your site...nice blog too. never had this. looks colorful and yummy. Hi Deepa and Tanu. First time here and came here from Rachana's blog. I have never attempted the Mughlai Paratha, I had an understanding that it's kneaded in warm milk and only Keema can be stuffed, but this egg version looks very interesting. Do find time to drop by and check out my space.